You know that sinking feeling you get when a bolt head snaps off as it snugs up? Well,these little grippers will lift more than just your mood. 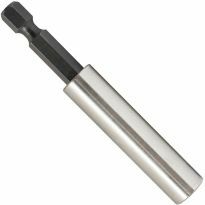 Sized specifically for smaller,more breakage-prone bolts less than 1/4" in shank diameter, they'll zip out the broken shank faster than you can say thanks. 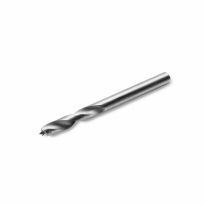 Each extractor sports two business ends: one a drill bit for boring a hole in the shank, the other an auger-like extractor that binds itself into the hole and wrenches the bolt free. 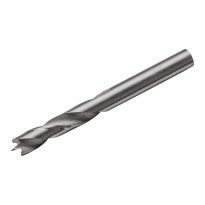 The self-centering drill tip prevents wandering and allows a clean pilot hole - even on jagged surfaces. 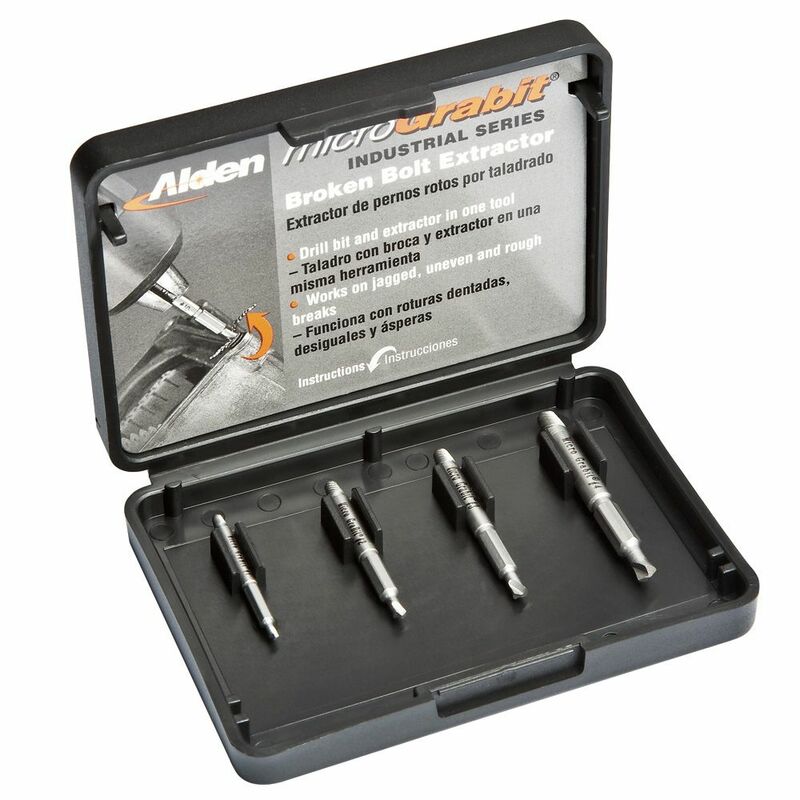 Kit includes extractors for the following bolt sizes: #5 or #6 (M3), #8 (M4), #10 or #12 (M5) and 1/4" (M6). 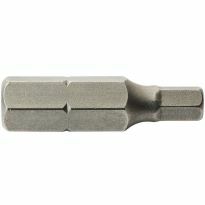 "You never see happy people buying screw extractors"
True. But, if you get this, chances are you'll be a lot happier pretty soon. 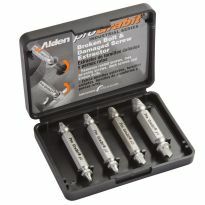 The small sizes of this set complement the larger sizes I already had, and work just fine for the less catastrophic kinds of extraction jobs - you know, the ones where you didn't torque the head clean off. They work great and I would highly recommend them. I tried to remove some #6 wood screws from an old cylinder phonograph bottom. The heads were rusted away from being exposed to water in a basement. 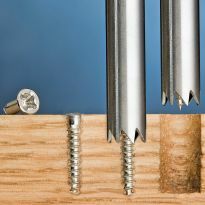 The end of the screw extractor for drilling would not penetrate far enough into the screws. As a result, the other end of the extractor could not get enough grip to remove the screws. It worked great the first time but after that it would not work. I think the end meant to drill a hole into the broken screw became dull. Is this grabit kit made of hardened steel? BEST ANSWER: Alden is the manufacturer. Their website says that they are made from twice tempered M2 HSS. Maybe, but it did not work. Will this work on hard deck screws ? 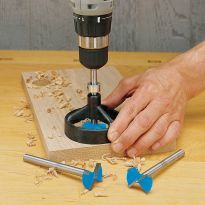 BEST ANSWER: Not sure, if you can drill a hole into the deck screw for the screw end to bite into it might. I did not have much luck using the drill end of the extractor. YES...YES....DO NOT use High Speed....Test From Middle Speed Down. You WILL find the Right One. Will this remove #4 screws? BEST ANSWER: Hmmm.... I doubt you'd have any success with a screw that small... the Micro Grabit website says you can remove screws as small as #5, but it seems to me that's going to be pretty difficult to drill a hole in a screw that small! The smallest extractor is listed for #5 and #6, comparing the extractor with some #4 flatheads, maybe, if you have some head left on the screw it would, the drill/extractor looks to be too big to drill/extract if the head of the screw is gone (the bit is about the same diameter of the shank of a #4). Caliper indicates .073" drill dia on the #1. #4 thread diameter listed as 0.11" (I measured .112"). doubtful it would work on just the shank portion of a #4. Good luck. What's the warranty for this product? I've used it successfully a few times but now the tip broke off.